A fantastically beautiful and decorative plant, very individual in character. 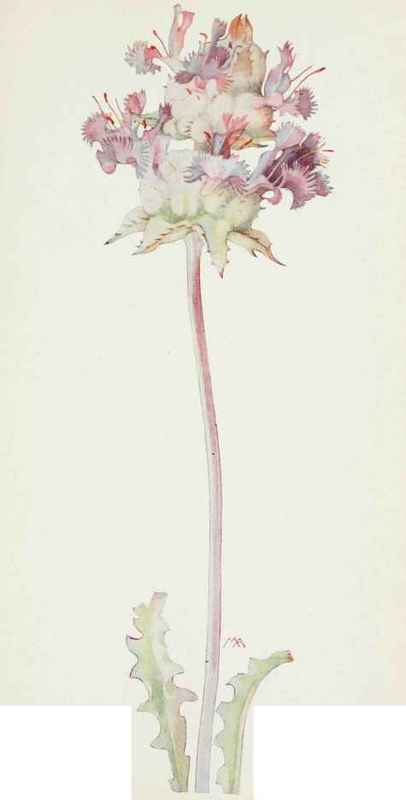 The stout purplish stem, a foot or two tall and covered with white wool, springs from a rosette of thistle-like leaves of palest green, so thickly covered with cushions of white wool that they appear to be inflated, their teeth tipped with brown spines. The stem bears a series of flower-clusters, resembling large, round, pale balls of wcol, pierced here and there by long prickles and encircled by lovely flowers, so etherial that they appear almost to hover in the air. They are each about an inch long, the corolla clear bright lilac with an erect upper lip with two lobes, their fringed tips crossed one over the other, and the lower lip with small side lobes and a very large, fan-shaped, middle lobe, which is delicately fringed with white. The pistil is purple and the anthers are bright orange, which gives a piquant touch to the whole color scheme of pale green and lilac. There are several tiers of these soft yet prickly balls, which suggest the pale green turbans of an eastern potentate, wreathed with flowers. The buds poke their little noses through the wool, in a most fascinating way. like babies coming out of a woolly blanket, and fresh buds keep on coming through and expanding as the faded blossoms fall, so that these flowers last longer in water than we would expect from their fragile appearance. The plants when they are crushed give out a rather heavy smell of sage, with a dash of lemon verbena. They grow on the dry open plains of the South.